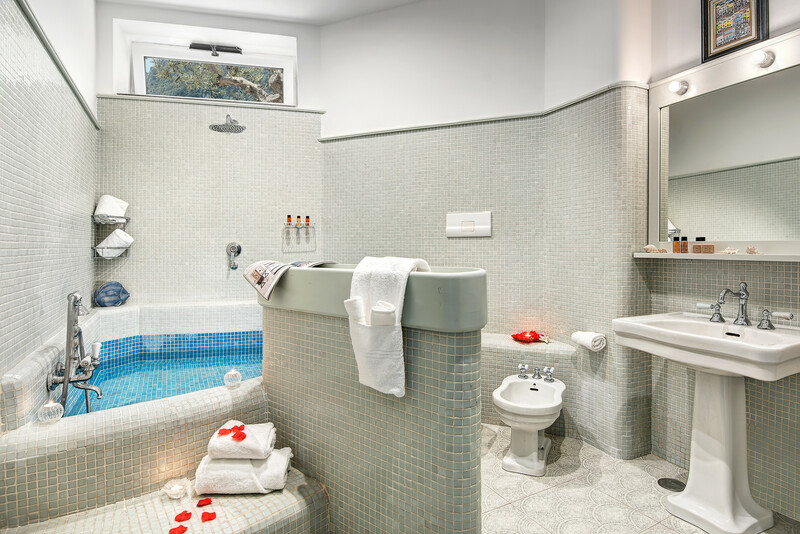 Villa Milena is the boutique hotel of the villa world – sophisticated, stylish and indulgent. Fantastic views, great outdoor space, a swimming pool and room to sleep 8. 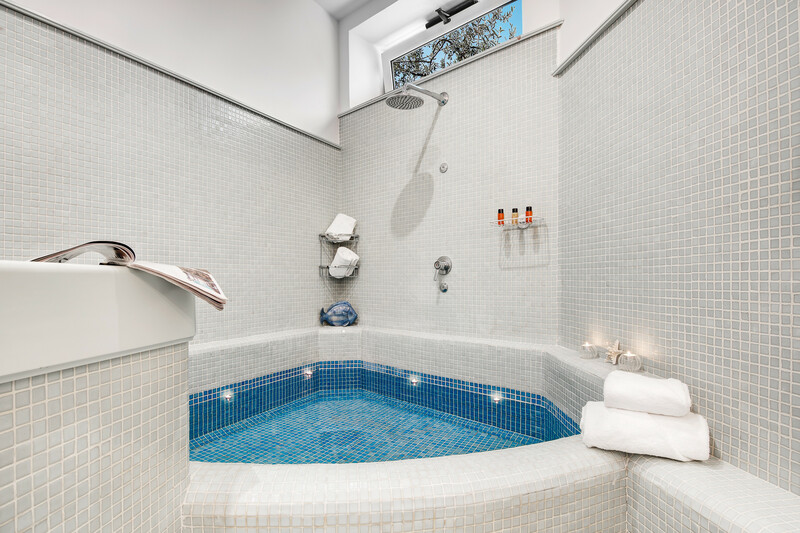 Villa Milena has that ‘wow’ factor inside and out. 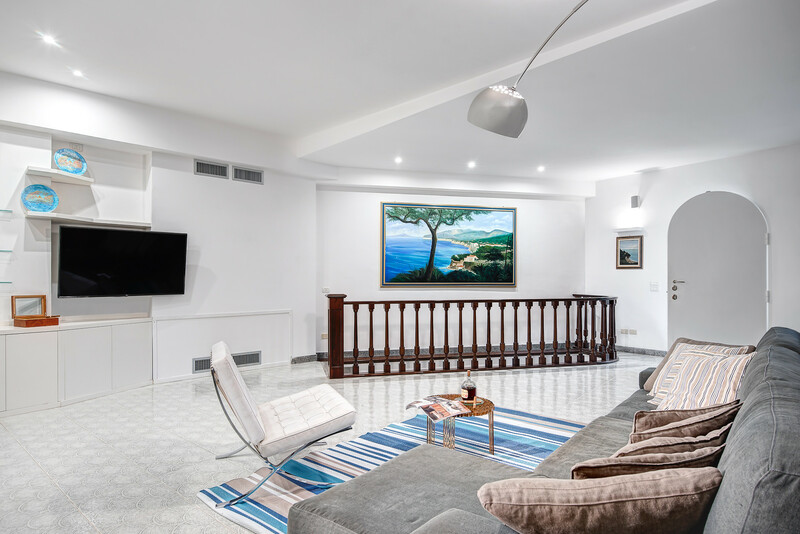 Nestled in the hills above Sant’Agata sui due Golfi and set over three levels, this luxurious, state-of-the-art property is made for a relaxing holiday. 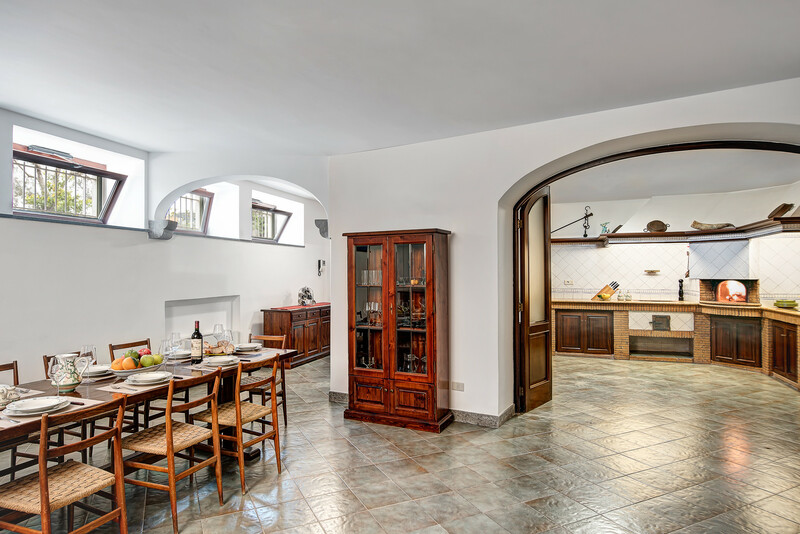 Villa Milena is a large, spacious property set over three levels – two indoors and one outdoors. Enter through electric gates to off-road parking and you are immediately struck by the magnificent view over the rugged hills of the Sorrentine peninsula and the Bay of Naples. This is a villa for those who take relaxation seriously; whether you enjoy cooking, eating or exercise, this villa can help you do it properly with its professional kitchen and massive dining space indoors, its stylish, minimal space to relax, its well-equipped gym area and the outdoor kitchen and dining area with its sea view and swimming pool. 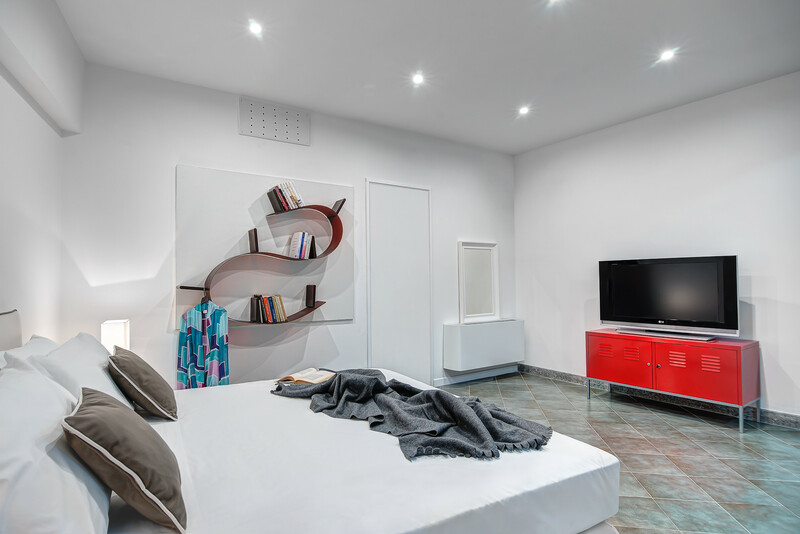 Enter the property on the middle of the three floors and find yourself in a cool, stylish living room with a huge, comfortable double sofa bed, an enormous flat-screen TV and a cosy corner fireplace for when the chill sets in. Double doors take you out to a balcony and up to the upper, outside space. Stairs down take you to the kitchen level. 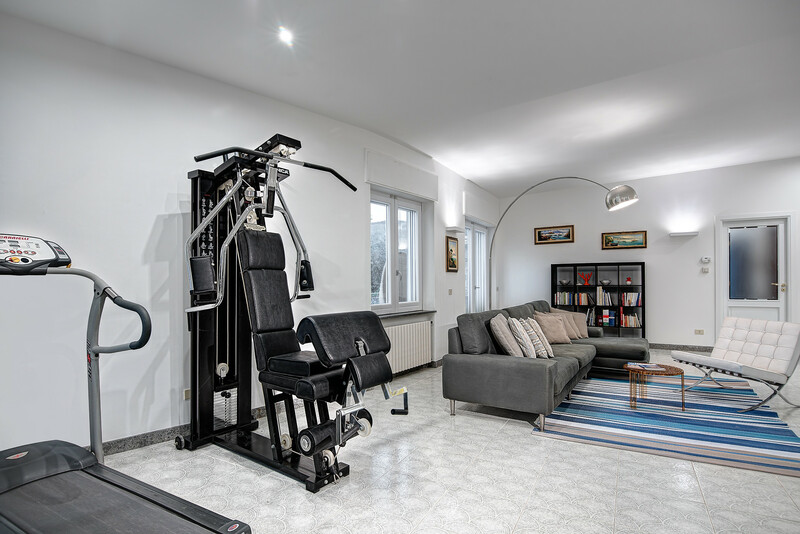 This villa is so spacious that the indoor gym in one corner barely encroaches on this relaxing room. Choose a cardio workout on the running machine or tone up on the multi-gym. The three bedrooms; two off the living space and one downstairs off the kitchen. The rooms are fresh, bright and spacious; one has doors to the balcony outside and one has a TV. Each has its own character, vibrant pings of colour, a large double bed and plenty of storage. 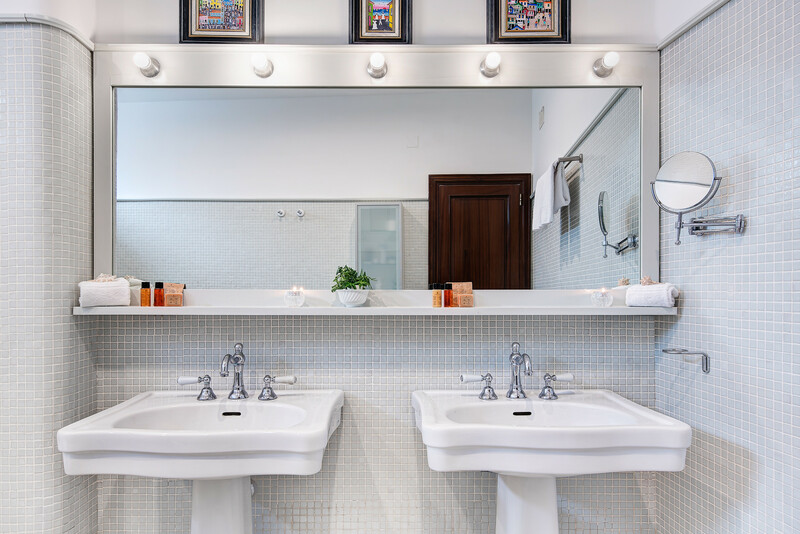 The two spa-style bathrooms are the height of elegant luxury. 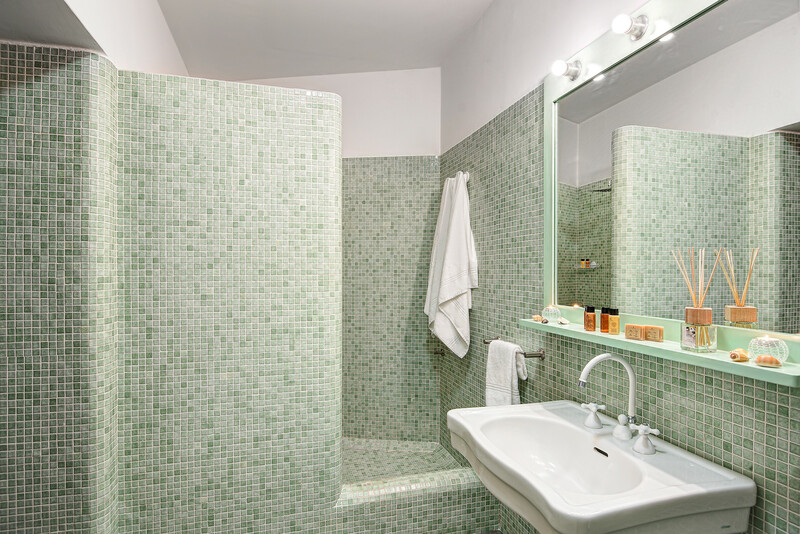 Both beautifully mosaic-tiled, one has a large, walk-in shower; the other a deluxe corner bath. 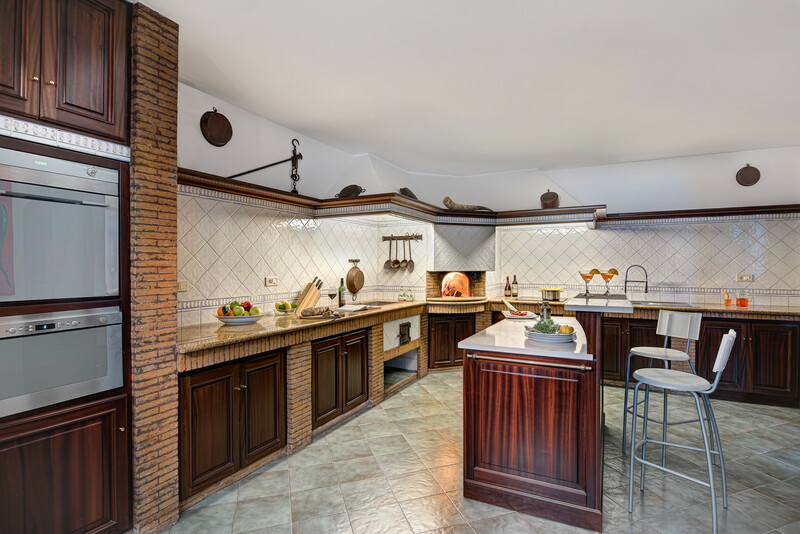 Outdone only by the amazing terrace above, the kitchen is the heart of this special villa. 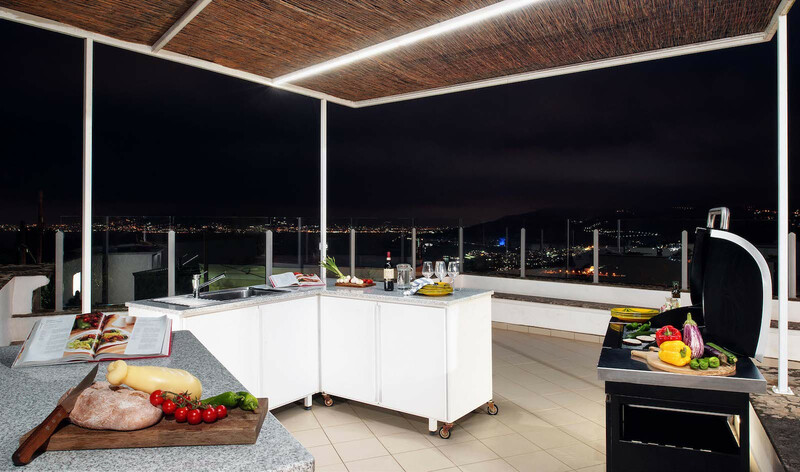 It is professionally equipped with a pizza oven and an electric oven designed to fit an old wood-burning stove, wine fridge, contemporary oven, microwave and hob. Take advantage of these exceptional facilities to make the best of our abundant local produce. Through the arch, out of the kitchen, is a vast dining space – perfect for entertaining – a large TV and a sofa to relax on while dinner bubbles away. The villa roof is the outstanding feature of this stunning property. 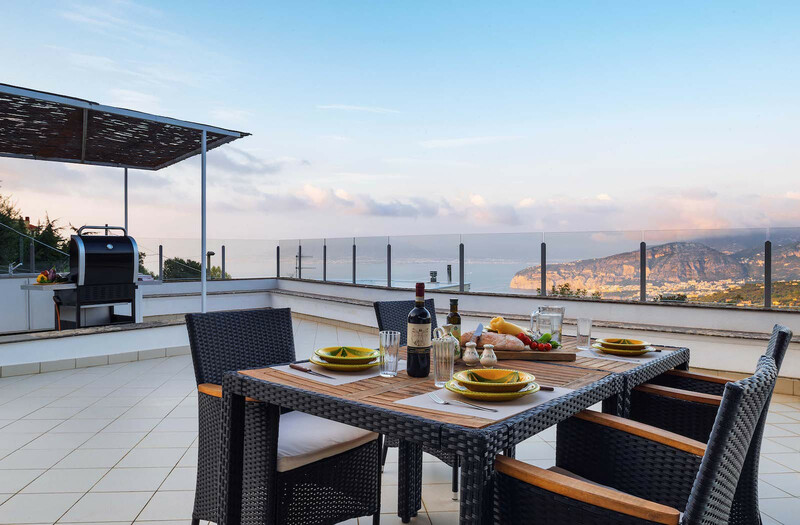 It acts as a sweeping terrace with views over the hills and across the sparkling waters to Capri. If you can tear yourself away from this stunning view you will be met by more luxury. This large space is home to a second, fully-equipped outdoor kitchen with a professional gas barbecue and large dining space; a free-standing swimming pool, a shaded area with loungers to relax on, and a peaceful corner to sit, enjoy a cappuccino and plan your day. The rugged hills above Massa Lubrense offer amazing views of this unspoilt peninsula at every turn and are criss-crossed with paths and tracks through lemon and olive groves, making this fantastic walking country. The hilltop village of Sant’Agata sui Due Golfi is a fairly level ten-minute walk away and has spectacular views over the Bay of Naples on one side and the Bay of Salerno on the other. It is home to several good restaurants and food shops. The town of Massa Lubrense – known as the ‘Land of the Sirens’ – is 2.5 km away on the coast, with scenic, pastel-painted houses perched on the cliffs and boats in the small harbour. The town offers plenty of shopping, eateries and bars, as well as interesting cathedrals and other attractions. 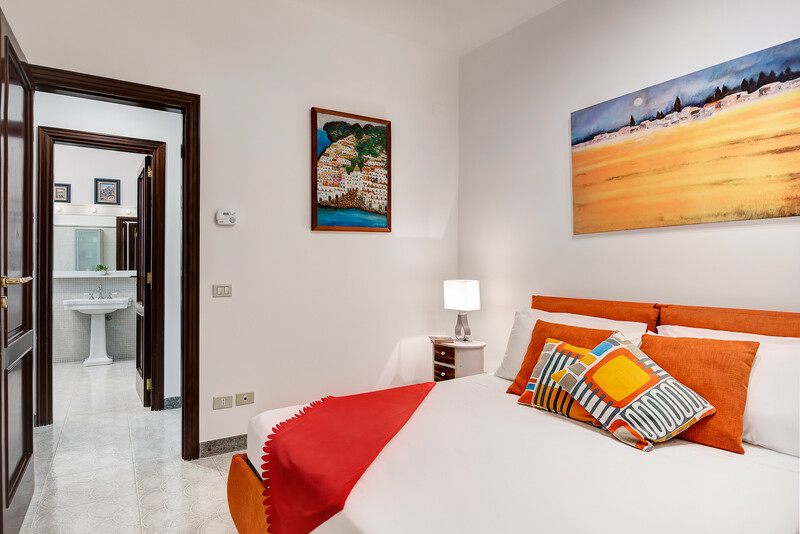 Sorrento is a 20-minute drive away with its narrow, cobbled streets, splendid piazzas and beautiful views over the water to Naples and Mount Vesuvius. 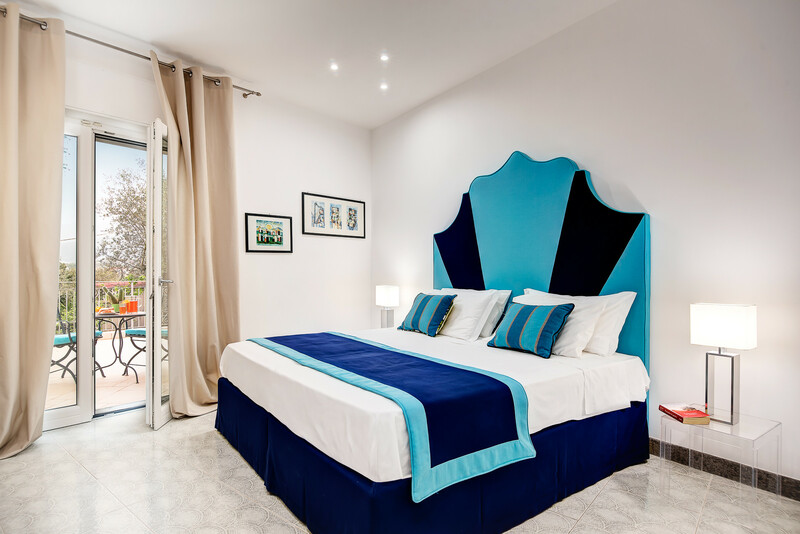 Villa Mirena has everything you need for a fantastic, relaxing holiday – whether you choose to explore the local area or stay and enjoy its luxurious amenities. Book your own pizza party! 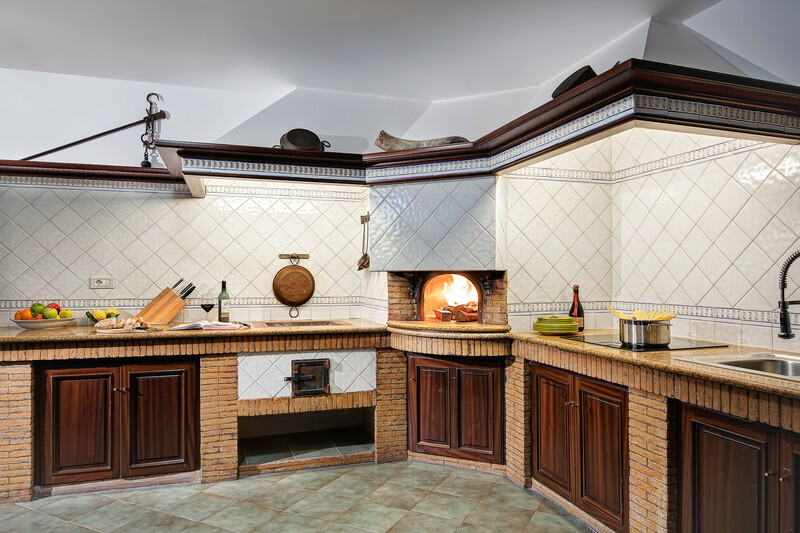 We are happy to arrange for a Pizzaiolo professional to come to your villa and show you the traditional art of pizza making. Your party can then enjoy a delicious meal, tasting a variety of pizzas made with wonderful, fresh local ingredients. 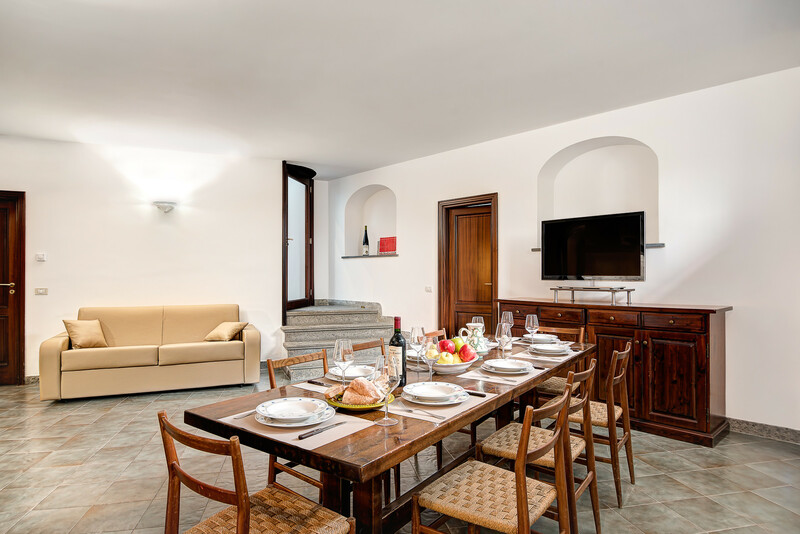 At Feeling Italy, we offer a few extras to make your holiday truly special. We can provide a local guide to the stunning local landmarks; take you on motor or boat tours along this amazing coast; arrange unforgettable excursions; make sure you are pampered with a relaxing massage or relaxed with a session of yoga; or treat you to Italian cuisine at its best with chef cooking just for you. Please note that from 1st April to 30 October, the Municipality of Massa Lubrense applies a mandatory tax to temporary residents of €3.00 Euros per adult, per night which must be paid in cash on arrival. TV, terrace, barbecue, iron, internet (Wi-Fi), hair dryer, balcony, 140 m² property, private swimming pool, Open-air parking (2 places) in the same building. 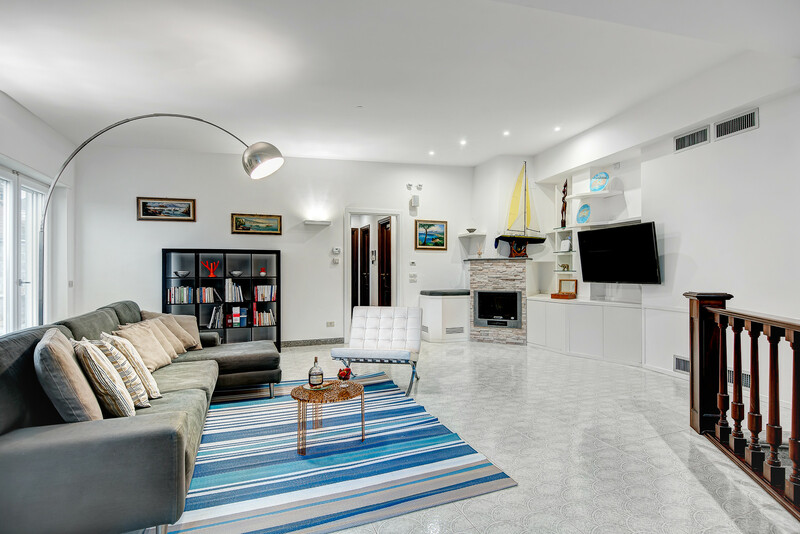 The location, the views, the space, the ease of access to sorrento. The keyholder was at the end of a text if needed and property was clean. The villa was only an hour from Naples airport. Beautiful villa in fantastic location. Very friendly and welcoming host. (reviewed on booking . com) Beautiful villa. 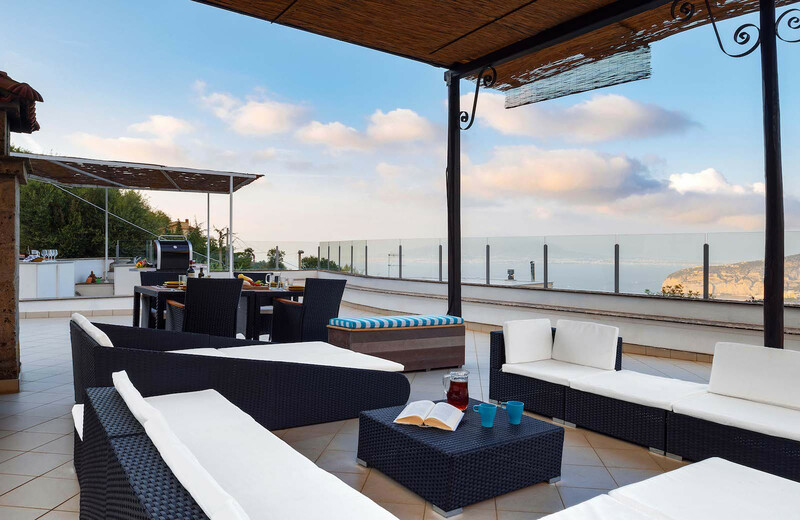 Fantastic roof top terrace with views of the sea and Vesuvius. The welcome basket. The hosts agent was late meeting us, keeping us by the busy roadside in the traffic and hot sun for 15 minutes. A key safe would be much more convenient. The hosts agent then charged us €60 for city taxes that we had already paid to Booking.com. Initially wanted us to take it up with Booking.com but this was wrong. It is surely up to the host to fix arrangements for this so the guest is not charged twice. Anyway after several days of wrangling he agreed to repay at the end of the holiday but the issue hung over the the whole week.